This Is a hysterical take on the chicken little story. I love to read this to second and third graders. 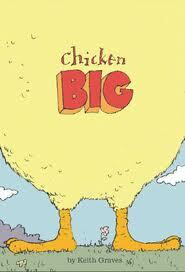 A humongous chick is born and joins his fellow chickens in the chicken coop. No one seems to realize that he is a chicken. The smallest chicken is not the brightest chicken in the coop. When he is hit with a falling acorn and then rain drops he becomes just like Chicken Little. Poor Chicken Big tries to calm the chickens while they guess again and again what he might be…is he an elephant, a squirrel, an umbrella? Each guess is more hilarious. Such a fun book – always a hit with my students.